Samuel Houston (1793-1863) – Nineteenth Century statesman, politician, soldier, and a key figure in the Texas Revolution, Houston was born at Timber Ridge Church, near Lexington, Virginia, on March 2, 1793. His father, Major Houston, served in the American Revolution, and after his death, which took place when Sam was just 14, his mother emigrated to Tennessee. Heading southwest, he lived for a few years with a Cherokee band located on the on the Hiwassee River above its confluence with the Tennessee River. There, he became an adoptive son to the chief and was given the Cherokee name of Colonneh, meaning “the Raven”. He also learned to speak the Cherokee language fluently. He returned to Maryville, Tennessee in 1812, and at age 19, Houston founded a one-room schoolhouse, the first school built in Tennessee. He taught at the school for a couple of years until he enlisted in a Tennessee Volunteer Regiment. He soon reached the grade of ensign and fought under General Jackson at the Battle of Horseshoe Bend on the Tallapoosa River in Alabama during the War of 1812. In this stubborn engagement. Houston proved himself a hero, was severely wounded by an arrow and took two bullets in his right shoulder. After taking some time to recover, he became an agent to the Cherokee Nation and took a delegation of them to Washington. Feeling that his services had received but slight recognition from the government, he returned home, resigned his commission, and went to Nashville, Tennessee to study law. After he was admitted to the bar, he became district attorney, and later, a major-general of the state and elected to the US House of Representatives for Tennessee in 1822. In 1827 he declined to run for re-election to Congress and instead, ran, and won, the office of Governor of Tennessee. On January 22, 1829, at the age of 35, Houston married 19-year-old Eliza Allen of Gallatin, Tennessee. Though it is unknown what happened between the two of them and Houston refused to discuss the matter, Eliza left him shortly after their marriage. After the separation, Houston resigned as governor in April 1829 and went west with the Cherokee to exile in Arkansas Territory. That year he was adopted as a citizen of the nation. Under Cherokee law, he married Diana Rogers Gentry, a part-Cherokee widow and the two would live together for the next several years. He participated in Cherokee councils and visited Washington on behalf of the tribe in 1830, and again in 1832. In December 1832, Houston moved to Texas, then a part of Mexico. His Indian wife, Diana, declined to accompany him and later remarried. He was quickly swept up in the politics of those who wished to seek independence from Mexico. The Texas Army commissioned him as Major General in November 1835 and at the convention to declare Texan Independence in March 1836, he was made Commander-in-Chief. In the meantime, the Battle of the Alamo had taken place during the convention, whereby Santa Anna and his forces killed every last man. 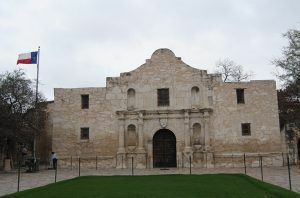 At the Battle of the Alamo, a few devoted Texans had taken refuge in an old church and were besieged by an overwhelming force of Mexicans. William B. Travis, their gallant commander, did all that mortal man could do to strengthen the place. The enemy made two unsuccessful attempts to scale the walls. On the third attempt, the Texans, whose ammunition was then exhausted, were overpowered. With clubbed guns, the survivors fought on until nearly their whole number was cut down. Travis fell near the western wall; David Crockett in a corner near the church. James Bowie was butchered and mutilated on his sickbed. Samuel Evans was shot while attempting to fire the magazine, a duty which, by agreement among the defenders, had fallen to him as the survivor. There had been no surrender; there had been no retreat. One brief hour after the Sabbath sun had touched the grim walls flying the flag of the Lone Star Republic, the sacrifice for country was complete. While Travis and his men were fighting for their lives, James W. Fannin and his force of about 350 were ordered to help them, but, Fannin had turned back his troops at the San Antonio River, failing to assist Travis and his men. Houston then ordered him to retreat back to Victoria. However, in route, they were attacked by the Mexican Cavalry on March 19, 1836. 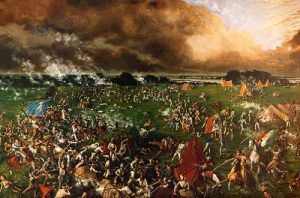 After a fierce fight known as the Battle of Coleto, the Texans were overwhelmed by the sheer numbers of Mexicans and surrendered the next day. They were escorted back to Goliad as prisoners. When Santa Anna received news that they had not been executed on the spot, he was furious and ordered that they be executed. On March 27th, the soldiers were divided into three groups, marched onto open prairie, and shot. At the Battle of San Jacinto on April 21, 1836, Houston surprised Santa Anna and the Mexican forces during their afternoon siesta. Texas forces defeated them in less than 18 minutes. Badly beaten, Santa Anna was forced to sign the Treaty of Velasco, granting Texas independence. Although Houston stayed on briefly for negotiations, he soon returned to the United States for treatment of a wound to his ankle. 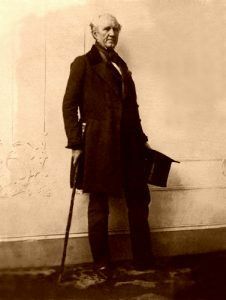 Houston was then elected President of the Texas Republic on September 5, 1836, and served two terms. He ruled wisely, made treaties with warlike Indians, and eventually succeeded in having Texas admitted into the Union. While serving as President of Texas, 47-year-old Houston married for a third time on May 9, 1840, to the 21-year-old Margaret Moffette Lea. They had eight children together. Afterward, he became a United States Senator, and then Governor of the new state. When the Civil War broke out, he refused to swear to the Confederacy when Texas seceded from the Union and resigned as governor. Though a slaveholder and opponent of abolitionism, he had unionist convictions. To avoid bloodshed, he refused an offer of a Union army to put down the Confederate rebellion. Instead, he retired to Huntsville, Texas where he died on July 25, 1863. About the Article: This article was primarily written by Hartwell James as part of his book, Military Heroes of the United States from Lexington to Santiago, published in 1899. However, the original article has been heavily edited and expanded to include additional information.